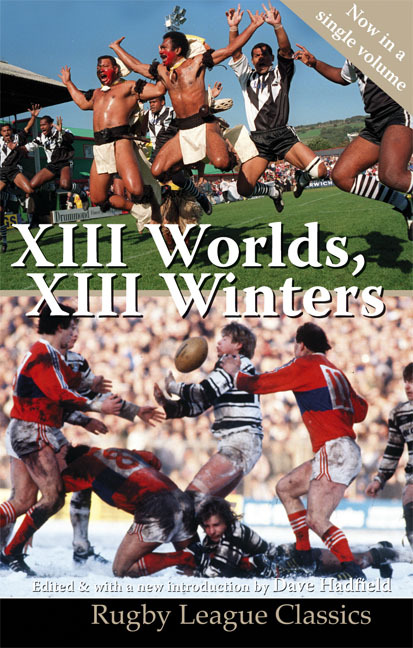 The fourth in Scratching Shed's Rugby League Classics series and published in a single volume for the very first time, XIII Worlds, XIII Winters represents a high-water mark in the development of quality rugby league literature. The book comes complete with a brand new introduction, penned by its editor, the renowned rugby league writer, journalist and broadcaster Dave Hadfield. Paperback, 496 pages. Free postage & packing. The idea for XIII Winters, as its editor, Dave Hadfield, freely admitted upon its original publication, was pinched from Nick Hornby’s My Favourite Year – with which it had one contributor in common. Hornby’s tome was a collection of essays by writers and fans about a favourite year following their favourite football team. In XIII Winters, Dave Hadfield set out to do the very same thing with rugby league and succeeded absolutely. Published by Mainstream in association with Open Rugby magazine, XIII Winters boasted chapters by the likes of Harry Edgar, Martin and Simon Kelner, Huw Richards, and the soon-to-be Rugby Football League boss Neil Tunnicliffe, among others. Its writers may not have realised it at the time but, in the mid-1990s, when a switch to summer was just around the corner, rugby league’s long-standing association with the depths of the English winter would soon be lost, presumably forever. Indeed, such was the chord struck by XIII Winters that Hadfield & Co followed it up with XIII Worlds, an equally lively celebration of rugby league’s often maligned international dimension. Although not as big a seller as its predecessor, subsequent events and the passing of the years have rendered this entertaining, witty and often overlooked collection worthy of reappraisal. So here they are - brought together for the first time in a single volume as part of the Rugby League Classics series. Complete with a brand new introduction, penned by Dave Hadfield himself, XIII Worlds, XIII Winters represents a clear high-water mark in the development of quality rugby league literature.